FTC disclaimer: I was provided a book by the publisher for review purposes. All opinions are my own. This post contains affiliate links. 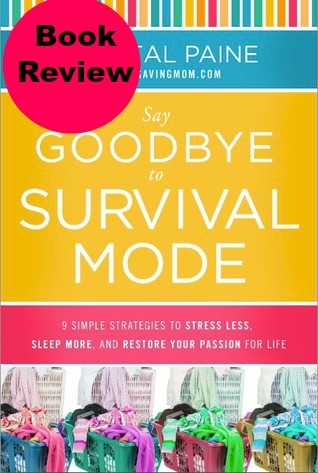 I was captivated with just the title of the book Say Goodbye to Survival Mode. After all, what woman feels she has enough time to do everything she wants to do? It doesn’t matter if you are single, married, young, or old, this book will apply to you. What Chrystal Paine does is outline nine steps to help you get rid of the haired, rushed feeling you often have and learn to live in a more peaceful environment. It won’t happen overnight, and it’s not a super-easy quick fix, (after all, chances are you got yourself into this situation by saying yes one too many times!) but it is do-able to have a bit more simplistic life — even if that “simplistic” life includes lots of business trips or a large number of children! She gives baby steps to achieve these goals, yet doesn’t talk down to the reader as I’ve seen some books do. Instead, the author can sympathize with you. She once was overly stressed and learned how to manage it one step at a time — one sticky note at a time, and one load of laundry at a time. Two chapters I really enjoyed were “When you Feel Like a Failure”. I don’t know about others, but when I feel like a failure that’s when I want to throw in the towel and just say “That’s enough, I quit” but then I just get right back on the ‘treadmill’ that was causing me so much stress in the first place. I work at home and recently my mother was asking me about a time I decided to quit my job. It lasted three months. I didn’t make any major changes until recently in that, and the stress continued just as it had been. Now I have a new sales technique, new way of dealing with customers, and it’s a much happier experience for me — but usually I just continue doing what got me so stressed in the first place! Another chapter I enjoyed was “You Can Make a Difference”. The author runs the popular blog, Money Saving Mom. 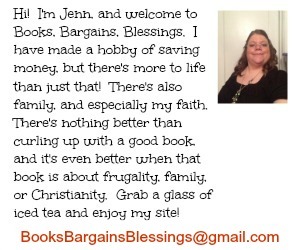 She talks about how she was able to give out of her abundance she had gotten free with coupons. I’ve always tried to be a giving person. There were times when I was a teenager we could barely afford necessities but because of my coupons, I was able to give to others (and just like her in one place in the story, there were even times I would have missed on social occasions if I wouldn’t have been able to take food in place of paying an amount for cost of snacks!) The author reminds us that while we may have busy, almost out of control lives, there are always people worse off than we are. This book is a fantastic read. It is like a chat with the author, and I highly recommend it if you are stressed and want more peace in your life! You can read a free preview below and purchase the book at Amazon.